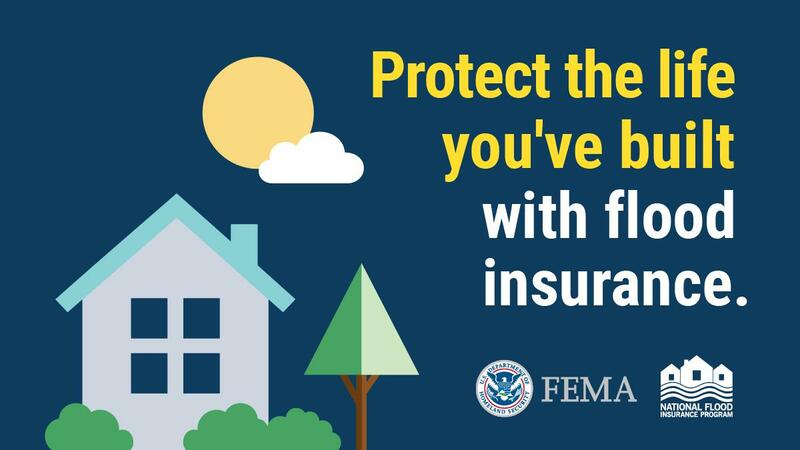 Your home has been damaged and you want to get it back to where it was before Hurricane Sandy. Or, maybe you’re looking to rebuild and need smart ideas on how to make your next home stronger and safer than your last. Knowledgeable and reliable advice is available at a nearby home improvement store daily from 8 a.m. to 6 p.m. until Nov. 26. Hazard mitigation specialists from FEMA are on-site to answer your questions and help you rebuild stronger, safer and smarter. They specialize in building techniques that reduce the potential for damage to your home, business and property from future disasters. On Thursday, 11-22-12, Holgate will be open to residents FROM WEBSTER AVE NORTH, including Webster Ave. Any resident/contractor needing to go south of Webster Ave will be permitted to do so with the proper paperwork, i.e. ; resident access pass, contractor pass, work order from homeowner, etc. Contractors and homeowners are to be out of Holgate in the areas south of Webster Ave. from 5:00 pm to 7:00 am. Everywhere they look, survivors of Hurricane Sandy see reminders of the destruction – fallen trees, washed out roads, smashed windows. But the most persistent reminder may be the least visible: mold. The microscopic fungus grows wherever moisture is present – in debris, inside walls, under floors, in attics. If not treated, mold can cause disease, trigger allergic reactions and damage materials long after the storm. The good news: mold, and its close relative mildew, can be controlled. Once a home is habitable, dry it out with fans, dehumidifiers and vacuums. Remove all wet items including carpeting, furniture, insulation, food products and bedding. Any material that has been wet more than 48 hours should be thrown out! An estimated 100,000 households in certain counties may be eligibleTRENTON – The Christie Administration today announced that it will implement a federal food assistance benefit for individuals and families in certain counties, who are not already enrolled in the Supplemental Nutrition Assistance Program (SNAP). An estimated 100,000 households hardest hit by Hurricane Sandy may be eligible for at least $200 in electronic benefits. Disaster SNAP, called D-SNAP, is administered by the US Department of Agriculture’s Food and Nutrition Services through the Department of Human Services (DHS) and the counties’ Boards of Social Services. Applications for the program will begin on Monday, November 26 and run for seven business days, concluding on either Monday, December 3rd or Tuesday, December 4th, depending on whether a particular county processes applications on Saturday, December 1st. Natural gas is now available to 9,878 of our customers’ meters, which is 69 percent of our total customers on Long Beach Island. By the end of the day, we will have re-pressurized our entire main on Long Beach Island, including Holgate. Meters have been repaired and replaced on the entire northern end of the island. We are now completing our meter work on the southern end of the island, and expect to complete all rebuilds by Monday, November 26. Once a meter has been re-established and you see a tag on the customer gas valve just past your meter, your home’s natural gas service may be turned on by your qualified technician-- but only after electricity has been restored, you have safely returned to your home, and your qualified technician has determined that your natural gas equipment is safe to operate. Clothing, toiletries, cleaning items, toys, non-perishable food, are available today, November 21, from 9:00 a.m. to 5:00 p.m. at the Long Beach Island Grade School located at 20th and Central, Ship Bottom, NJ 08008. So that the volunteers may enjoy the holiday with their families, the donation center will be closed Thanksgiving and will reopen Friday, November 23, 9:00 a.m. to 5:00 p.m.
As of 7 a.m. Thursday, November 22 all streets north of and including Webster Ave (Webster Ave., Susan Ave., Marshall Ave., Osborne Ave., and Grosser Street) including Beck Ave. will be open. The rest of Holgate has severe sewer, water and gas problems. We will notify you when it is safe to return. On Wednesday November 21, 2012 Holgate will be closed to all non-essential personnel due to New Jersey Natural Gas working on the restoration of gas service to the Holgate section of Long Beach Township. Tomorrow, Tuesday, November 20, New Jersey Natural Gas will be working on our service restoration plan for Long Beach Island in the section of the island from Ocean Street to Nelson Avenue. We are currently in the process of working with Ashbritt Environmental for removing all debris that has been accumulating at our curbs. Their plan is to remove all debris from the ACME lot tomorrow (11/19/2012) and then begin to remove debris from the streets beginning Tuesday (11/20/2012). Please place your items at the curb line and off of the street. Separate all Hazardous materials, electronics, tires, engines, metals, and any recyclables. Please keep regular household garage in cans and separate from the bulk trash, being that front end loaders will be pushing the bulk materials into intersections to be picked up. Please keep all vehicles off of the road during this process! Anyone still wishing to make donations to the LBI relief fund can do so at the LBI grade school, 20th and Central Ave in Ship Bottom. Some items needed are; Pillows, rakes and flat shovels, extension cords, coffee, utility knives, batteries (all sizes), space heaters, bread, juice, paper plates and cups, utensils, cleaning and work gloves, paper towels, non-bleach cleaners. Garbage bags, breakfast food, bleach, water, flashlights, and mold/mildew cleaners are also in high demand. Thank you for your support! Boil Water Advisory Lifted for all towns north of North Beach Haven (does NOT include Beach Haven and Holgate). THE BOIL WATER ADVISORY IS LIFTED and it is no longer necessary to boil your water before using. Run your water faucets for 3-5 minutes to flush your interior plumbing.Empty and clean your automatic ice makers and water chillers.Drain and refill your hot water heater if the temperature is set below 113 degrees Fahrenheit Water softener/cartridge filters should be run through a regeneration cycle or other procedures recommended by the manufacturer. The Long Beach Island Joint emergency Management team has formerly requested a DRC (Disaster Recovery Center) for Long Beach Island. We have made the calls and put in the formal request. They have not ruled out that LBI is going to be getting one, however we will be having community relation specialists (not a DRC) at a location in the near future for guidance on starting the claim process for private residents and Businesses. The closest locations of DRCs are: Old Stafford Township Building 775 East Bay Avenue, Manahawkin, NJ 08050 and Bell Crest Plaza Store front 4C 953 Fisher Blvd., Toms River, NJ 08753. The closest BRC (Business recovery center) is Southern Ocean Chamber of Commerce, Stafford Heritage Park Train Station and Rail Car (across from Manahawkin Lake between RT 9 and RT 72) West Bay ave. , Manahawkin, NJ 08050. Hours: Sunday – Monday from 10 a.m. – 6 p.m., until further notice. NJNG- Has advised us that there are a number of homes that have been cleared for gas service to the resident’s meter. Those homeowners should contact a licensed technician to conduct complete inspections of gas systems within the home. Once deemed safe by a licensed technician, the gas service to the residence can be turned on by the technician. The technician should complete the certification tag and turn it into your respective town. In order to recognize which homes are ready for gas, look for a certification tag on the meter or log onto www.NJNG.com for a list of homes that have been cleared for. COMCAST- Has advised us that their infrastructure is in good working order. Any residents with problems/issues should contact Comcast directly. Holgate residents that hired contractors to remove sand or are removing sand themselves should be advised that only CLEAN and PRISTINE sand should be taken to the Holgate lot (end of Holgate) where it will be recovered. Residents from North Beach Haven through Brant Beach should take their CLEAN and PRISTINE sand to the beachfront where it will be recovered. Residents on the North end(North Beach/Loveladies) can take CLEAN and PRISTINE sand to Tract 1065(North Beach) and residents of Loveladies can take their CLEAN and PRISTINE sand to Tract 55 or place it on the beachfront of their legally owned Tract, where it will be recovered. Long Beach Township is suspending sales of Beach Buggy permits and revoking the use of vehicles on Long Beach Township beaches until further notice. Anyone wanting to fish may do so by walking onto the beach, except for the beaches of Holgate. Please pay attention due to the fact that Township Public Works vehicles and other contractor vehicles will be working on the beaches. Those who want to fish in other towns must call the respective town for their rules. 1-800-ASK-USPS (1-800-275-8777). CUSTOMERS CAN ALSO GET UPDATES ON MAIL DELIVERY BY CALLING 1-800-ASK-USPS OR AT USPS.COM. Please note that the United States Postal Service will continue to attempt mail delivery where there is safe access to roads and customers’ mail boxes and are committed to restoring regular delivery and mail service as quickly as possible to customers in affected areas. For the latest information on service disruptions in areas affected by hurricane Sandy, visit www.usps.com/news to review the state specific announcements or call 1-800-ASK-USPS (1-800-275-8777). Anyone that is able to donate cleaning supplies, toiletries, and non-perishable food please bring it to the LBI grade school located at 20th Street and Central Avenue. The school will be open for donations between 9:00 a.m. and 3:00 p.m. Thank you in advance for any assistance you can provide. Also, anyone that is in need of supplies or heaters please respond to the school during these hours. Please bring some proof of primary residency (driver’s license, deed, tax bill, etc). Driver’s will be required to enter on 20th street and central ave then look for Police Officers for further direction. Please refer to the following links for safety info with regards to flooded electrical systems in your home and/or business’. Residents and contractors will be allowed access to Holgate on Saturday, November 17 and Sunday, November 18 from 9 a.m. to 4 p.m. Please have your appropriate placard in the window for identification, along with your drivers license. Residents are encouraged to collect their medication, insurance papers, and other important personal affects. There will be no demolition and/or construction allowed in Holgate. Winterization only. Long Beach Township inspectors will be performing interior flood damage assessment prior to allowing Atlantic City Electric to restore power. Owners are encouraged to allow access to interiors of homes. Oceanfront homes posted UNSAFE and other posted structures may not be accessed for safety reasons. LBT Construction Department will be staffed Saturday, November 17 and Sunday, November 18. There will be NO utilities on. Further information to follow. Long Beach Island Office of Emergency Management is announcing that public donation of supplies, i.e, clothing, toiletries, cleaning items, toys, non-perishable food, etc., will be available for distribution to Island residents starting Tuesday, November 13th, 2012 from 9:00 a.m. to 3:00 p.m. at the Long Beach Island Grade School located at 19th and Central, Ship Bottom, NJ 08008. The Long Beach Island Joint Emergency Operations Center would like to remind the citizens that in the aftermath of Sandy, contractors of all kinds will invariably be coming to the area seeking to perform work. We are asking everyone to be careful when dealing with an unknown contractor. It is recommended that you be sure the contractor is registered with the State of New Jersey by checking them through the Better Business Bureau (www.newjersey.bbb.org) and through the Department of Consumer Affairs (www.njconsumeraffairs.gov). Get a written and signed contract from the contractor before any work is performed. Do not pay by cash or with a check written to “cash”, instead make the check out to the company name. DO NOT pay the entire amount up front, pay an agreed upon portion then pay in full when the work is completed. The governor has approved the re-entry plan. Bridge will be open on 11/10/12 at 6am. ALL LBI residents, except Holgate, with re-entry placard or proof of ownership/residency, (Deed, tax bill, utility bill, drivers license etc…), and registered contractors. Homeowners and contractors will be allowed to begin demolition. All insurance adjusters and inspectors are permitted with documentation and work order. All trash and refuse can be placed at curb, do not put in street or block fire hydrants. PLEASE DO NOT BLOCK ACCESS TO UTILITY METERS OR UTLITY SERVICE ON YOUR PROPERTY. There will be a curfew in effect between the hours of 11pm-5am, that will be strictly enforced. Please be aware that some areas of the island are still without sewer, water and/or electric. The entire island is without gas and as of this time the water is not potable and a boil water advisory is still in effect. Water must be boiled for a minimum of one minute to be safe. All animals from Toms River North, Pinelands Regional Middle School, and Burlington County are being housed in our Ocean County Barnegat Facility by the Humane Society of the United States. Anyone who wants to pick up their animal or is looking for their animal can call: 609-384-0300. If a person is not sure if their animal is at Barnegat, than they can call the PetFinder Hotline at 732-349-0150 ext 1030. The LSP has been assisting in search and rescue, patrol operations, and security since they arrived a couple of days after Sandy struck the area. 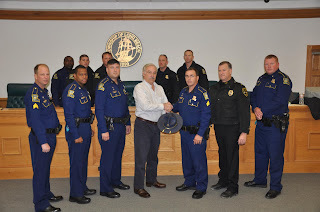 PICTURED:The Louisiana State Police (LSP) who have been assisting on and in the Long Beach Island area present a Louisiana State Police Hat to Mayor Joe Mancini and Chief Michael Bradley of Long Beach Township.Pictured left to right, Front Row: Sgt. Joey Adaway, Trooper James Benoit, Trooper Trent Hanks, Mayor Joseph Mancini, Sgt. Wayne Richard, Chief Michael Bradley, Trooper Michael Davis. Back Row: Trooper Tim Barlow, Trooper 1st Class Brett McKee, Trooper Jonathan Neck, Trooper Eric Regan and Trooper Tony Efthemes. Due to safety issues, Atlantic City Electric will be shutting down power from Susan Ave to the South end of Holgate. Please bring flashlights and be aware there will be no electric. This has been done to ensure that the residents can safely access their homes. The Long Beach Island Joint Emergency Management would like to advise that the Rt72/Causeway bridge will be closed to all eastbound traffic starting Wednesday 11-7 at 1:00 pm until Friday 11-9 at 6:00 am, due to the incoming Nor’easter. High tide at the bridge will be approximately 4:00 pm so we are insisting that all traffic be off the Island by 1:00 pm. Should there be any variation in the weather, these closure times will be changed accordingly. Please do not call the Police Station or Emergency Management trailer for questions regarding this announcement, utilize LBIEOC.ORG to monitor any changes with the bridge and all other storm related information. 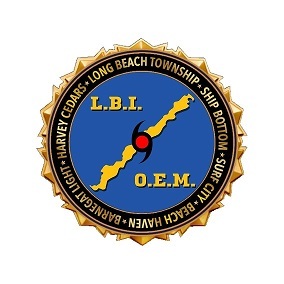 The Long Beach Township Office of Emergency Management would like to advise those that reside in Holgate and North Beach section of Long Beach Township that they will be allowed access to their homes on Friday, November 9, 2012 from 7 a.m. to 3 p.m. Please have your appropriate placard in the window for identification, along with your drivers license. Residents are encouraged to collect their medication, insurance papers, and other important personal affects. There will be no demolition and/or construction allowed. Please place debris and trash away from the easement so emergency vehicles can have access if need be. Parking will be in designated marked areas -- look for patrol officers for direction. Remember we are under a state water restriction, therefore no use of the hose, power washing or any other use of water. Also, the water in those sections are not drinkable so do not drink the water. The Long Beach Island Joint Emergency Operations Center would like to advise resident homeowners that they are allowing New Jersey State Licensed Plumbers and Electricians, and registered builders and home caretaking companies to come on the island to secure homes (shut off utilities and winterize homes). There will be no building of any sort allowed. This is to secure homes only! All plumbers, electricians and home caretaking companies should have documentation (work order or other proof of work) that allows them to be on property. Homeowners should contact their respective contractors and make sure they have proper documentation. All plumbers, electricians and home caretaking companies that will be working within the Joint Emergency Operation Towns (Long Beach Township, Ship Bottom, Harvey Cedars, and Barnegat Light) are to report to the Long Beach Township Municipal Complex where they will be registered and issued a contractors pass. Homeowners will not be permitted on the Island. Long Beach Island will be open to residents only, on Monday, November 5, 2012 from 7:00 a.m. – 3:00 p.m. Entry will take place from 7:00 a.m. – 12:00 noon. No one will be permitted to enter after 12:00 noon. Due to unsafe conditions, there will be no access for residences of Holgate and North Beach. Residents must show their re-entry placard, driver’s license showing an LBI address or proof of residence (i.e., tax bill, deed, etc.). November 3, 2012 9 p.m.
Workers are continuing to work to restore utilities on Long Beach Island. Crews have been working diligently to restore power and gas services. Currently there is no water or sewer service in the southern part of the island. The Long Beach Island Health Department is monitoring any health issues that may arise. Efforts are being made to repair these utilities also. Road crews are working with outside contractors to clear roads from sand and debris. Many areas are impassable on both ends of the island. There has been damage to may ocean front homes as well as many in the Holgate section of Long Beach Island. There are teams out actively assessing this damage on roadways and on properties. Kaplers Pharmacy is operating out of their sister store Medicine To Go Pharmacies in Forked River. They have access to the pharmacy computer and can retrieve prescription information. People can call (609) 242-1400. Homeowners are asked not to call for property status or checks. Please do not try to contact the police department if it is not a true medical or safety emergency. We will try to update you as soon as possible as to the condition of our community. We are working on making the Island safe so that the public may return. please try to be patient. Thank you. This is a message from the LBI Joint Emergency Operation Center: Be advised that there are no contractors allowed on the Island at this time. We have established a new website www.LBIEOC.org/contractors.html and due to the high volume of contractors calling there is a contractor sign up list. Please include the company name, contact person, phone number and email address. You will be contacted if your services are required. When the time comes for re-entry protocol will be established and you will be notified. Thank you. Residents of Barnegat Light may pick up their mail at the Manahawkin Post Office on East Bay Ave, Manahawkin. Residents of Beach Haven, Long Beach Township, Surf City, Ship Bottom and Harvey Cedars may pick up their mail at the Tuckerton Post Office, 139 Main Street, (route 9 South) Tuckerton. Tuckerton Post Office will be open on Sat. Nov. 3rd and Sun Nov 4th to accommodate residents. Status of the Township: we have no water, sewer, electric,gas, cable, or telephone lines. We are still in the recovery mode. We are clearing the main arteries, Long Beach Blvd. and Route 72 coming on to the island. Right now there is surplus sand all over the side streets, and until that sand is moved back on to the beach there is no safe transportation for people to get around. We are however going to try to allow Township residents, for a two hour period, on specific days for specific areas, such as Brant Beach, may be allowed back on Wednesday from 9 am to 12 pm to pick up vital items such as checkbooks, medication, insurance policies and then they must leave. This is tentative and this schedule will be published on the website Sunday 11/4 or Monday 11/5. As far as the election scheduled for Tuesday, we will post information as soon as we are notified.